It is important to breathe in through your nostrils. Inside your nostrils many tiny hairs grow. These little hairs help keep dust and germs out of your body. Under the skin inside your nose are many tiny tubes that carry warm blood through your nose. As the air goes over these warm tubes, it is heated. Then the air travels down a tube called the windpipe. The air goes into your lungs. Your body has two lungs. The lungs take the oxygen from the air you breathe. The oxygen goes from the lungs into the blood. The blood takes the oxygen to all parts of your body. When you were born, your mother listened carefully to hear your first cry. How happy she was to hear it! Do you know why? When you cried, she knew that your lungs had opened up to take in air. You could breathe for yourself! You will always have air in your lungs. Even when you exhale, or breathe out, you will have air in your lungs. Without air in your lungs you would not live. Take a deep breath. Close your mouth and take in air through your nose. Now let the air come out of your lungs. Write the answer in the blank using the correct word. Use the following words. 1. No living thing can live without ____________. 2. God made you so that you could use His gift of air by giving you a nose, windpipe, and ________. 3. You should breathe through your nostrils so that the little ____in the nostrils will keep dust and germs from going into the lungs. 4. The oxygen from the air in your lungs is picked up and carried to all parts of the body by the ________. 5. 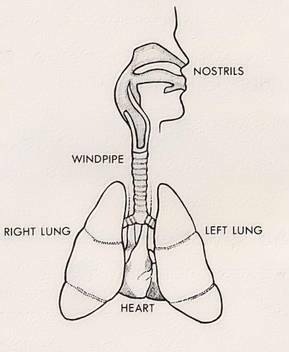 The many tiny tubes carrying blood through the inside of your nose ________ the air before it goes into your lungs. 6. The tube that carries air into your lungs is called the ________. Study the picture. Write the words from the picture that go in the blanks. 7. The openings in your nose shown in the picture are called _________. 8. The tube that goes to your lungs is the _____________. 9. How many lungs do you have? Breathe in and out through your nostrils again. Do you think it is easy? Even in your sleep you breathe. Your body keeps on working all the time. Inside of you many parts of your body work together to keep you well and make you grow. 10. What happened when you closed your hand around the sponge? 11. What happened when you opened the hand that held the sponge? 12. Did air fill the sponge? 1. Put your hands on your chest with your fingers touching. 13. When you breathed in, did your fingers move apart? 14. Why do you think they moved? 15. Did air fill your lungs?